To add service life to a road or street, it is important to keep drainage ditches, box culverts and cross pipes in good order to ensure the continuous flow of water from the street and gutters through the drainage systems. 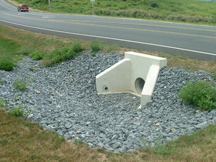 Cross pipes and drainage boxes collect road material and vegetation. These facilities also degrade in time and “cave in” over many years causing inefficient flows. Minor drainage system up-keep and replacement involves activities to keep water moving from the road surface to natural drainage courses. The Public Works Department conducts minor drain system assessment and repair projects as maintenance on select sections of road as needed. 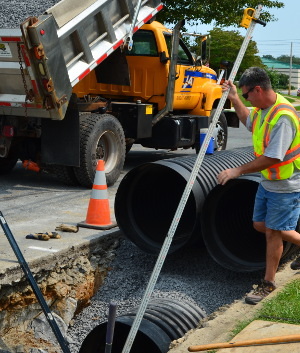 Drainage repair is also an essential component of any new road improvement project. 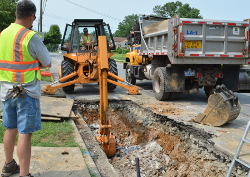 The Public Works Department monitors Storm Water Management issues and works with the Township Engineer for addressing roadway hazards and drainage problems. Storm water is the runoff that comes from parking lots, rooftops, etc. and flows into our storm drains and streams carrying silt, debris, fertilizer and other pollutants with it. Since storm water runoff is untreated, pollutants end up in our water resources. Storm Water Management integrates all aspects of storm water runoff to protect the environment and provide the highest quality of life for current and future generations. Storm water management also affects the operation and maintenance of the drainage system. The storm water system must be carefully inventoried and condition assessments must be made on a regular basis. Failures must be identified promptly and repaired while they are relatively simple to fix. Also, vegetation must be managed in an effective manner so that pollutants are filtered out and channel banks are not eroded. Storm water management is also a new approach for developing capital improvement programs to address existing storm water problems in the community. Additional land may be acquired to create a more natural condition rather than constructing a larger storm drain or channel or retention ponds may be developed that hold back a portion of runoff so flood levels are reduced.